They are split up into single, double (twin or double), triple, cuadruple rooms, all of them with private bathroom, hot water, towels, mosquito protected windows, bed sheets and closet. The kitchen is shared by everyone, completely equipped with 2 refrigerators, and much more, common area to relax, terrace with hammocks, access to Wi-Fi, TV room and living room. Our rooms are decorated in an innovative style. 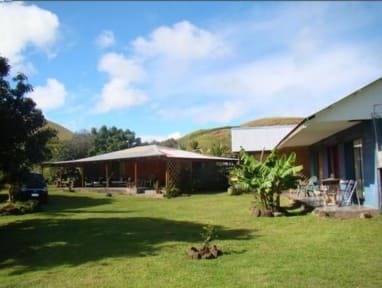 A beautiful vegetation in our surroundings will await you, with big fruit trees like Mangos, bananas and other common fruits of Rapa Nui.